It was a big time run from the first time runner. Jada Kenner (Tapestry Charter) may have the striking graduation date of 2024, but that doesn't stop the 7th grader from making waves at the State Level. Running at the New Balance Games, Kenner broke one of the oldest records on the books, taking home the 7th Grade State Record in 7.28. The previous State Record was held by Pam Jones (PS 120, Bronx) set way back in 1983. It very well could be older than her parents! Kenner has been on a tear this season, but is no stranger to the sport. She grew up in the USATF Pipeline, with performances back to 2017 and beyond. This is Kenner's fourth State Record of the Season. Although not recorded, Kenner surpassed the previous 60m 8th Grade State Record at the Kevin Dare Invitation, when she won in 7.79. That'll count towards the 7th Grade State Record. She also took home the 7th Grade State Record in the 200m at Kevin Dare, running 25.40, beating the previous record of 25.66 set by Nzingha Crusoe (Thurgood Marshall, PSAL) back in 2004. 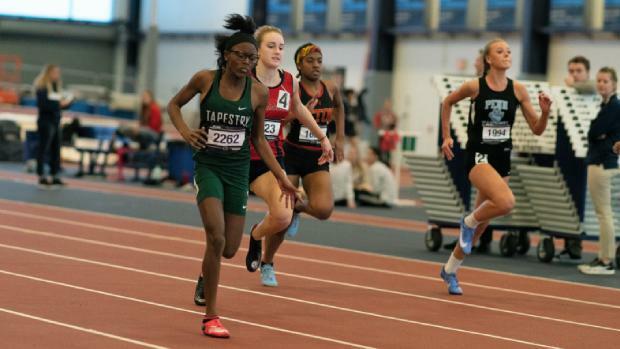 Likewise, she bettered the 300m 7th Grade State Record just last weekend, as her 41.27 winning performance at the Section 6 Varsity Select Meet, bested the previous Record held by Tinette Williams (IS 364, Brooklyn), set in 1981. Kenner is currently the Section Leader for Section 6 in the 55m, which means she'll have plenty of opportunity to improve throughout the Post-Season. For now, she's a name to watch whenever she steps on the line.